Have I mentioned that in 1983, I was really, really into reading my Dungeons & Dragons stuff? No parental assistance required: Sweat pants and a sweatshirt that looks like I removed the collar for that deep-V look that’s all the rage among dragon-slayers; cape from an old…bedspread, maybe? I can remember the material was heavy, but also kind of clingy and stretchy; tunic-vest-thing that I cut and stitched together myself out of some burlap-type cloth mom had around; and a belt that I probably wore every other day of the year, too. And now that “foil” sounds funny, I’ll move on. 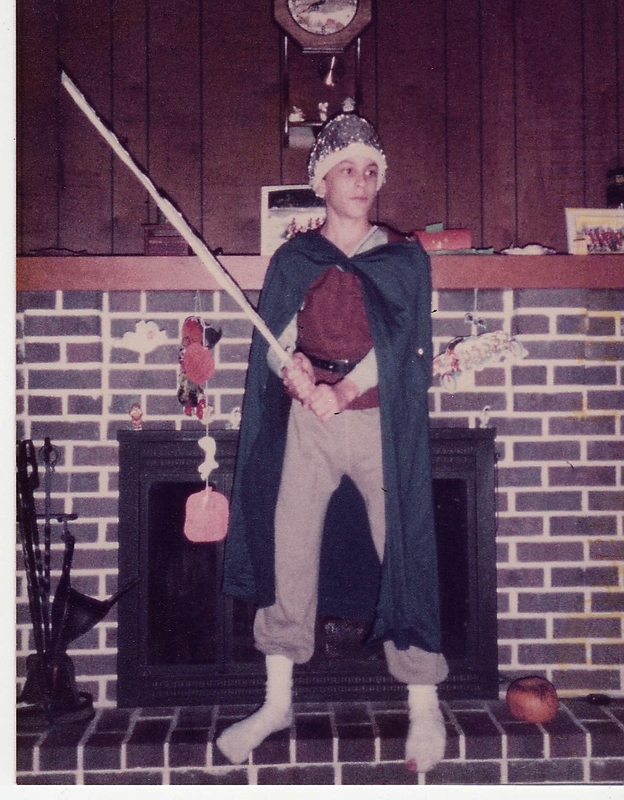 If I remember correctly, my fellow D&D wannabe Mike S. wore a pretty slick elf ranger costume he and his mom had made. More than once, I think, Mike and I took advantage of the trick-or-treat scheduling differences between the village of Hartville itself – where he lived – and Lake Township: One usually scheduled it on Halloween proper, while the other set it on the closest preceding weekend night, or something like that, making it possible for us to hit both of our neighborhoods. I seem to think we also really liked going out in the early hours of trick-or-treat, dropping off our candy haul at home, and then going back out after dark to roam the neighborhood and try to scare the kids we knew. Other bits and pieces nicely caught up in this photo: The Halloween decorations – store-bought and handmade alike – that my mom put out every year; the long-gone brick fireplace and wood paneling of our family room; the wooden set of coasters in their little boxy holder up there on the mantle (these go back practically to the beginning of my memory). For all the dorkiness captured in this picture – of me, that is; nothing against our family decor – I remain oddly proud of this costume, since I made the whole thing myself. In addition to the reviews and interviews I did for GeekDad this year, I also wrote a half-dozen posts about things like discovering the TV show Eureka, spooky Ray Bradbury stories, and attending the midnight showing of Harry Potter and the Deathly Hallows, Part 2 with my daughter. I loved writing these. Eureka – I Have (Finally) Found It! GeekDad also featured my Delving Into Dungeons & Dragons As A Family post – originally from summer 2010 – as a “wayback machine” post this July. Since this is one of my other favorites, I was glad to see it up there again. ©2010 WGBH / Cookie Jar Entertainment Inc.
Sept. 2010 – Further update: This entry has seen a bump in traffic since I posted the first images of Neil Gaiman’s cartoon appearance on PBS’ Arthur over at WIRED’s GeekDad blog. For more art and details from the episode – which premieres the week of October 25, 2010 – you should go read the whole article. Edit 2/5/10 – I wrote something. Neil Gaiman said he loved it. That’s kind of crazyawesome. Kelsey and I have been fans of PBS’ Arthur pretty much since she was old enough to focus her eyes on the television. We quote lines from the show just the way we do with Star Wars or Fringe or Help! It’s hard to say which of us is more excited that Neil Gaiman‘s going to be on the show, but the news inspired me to write this post for GeekDad.